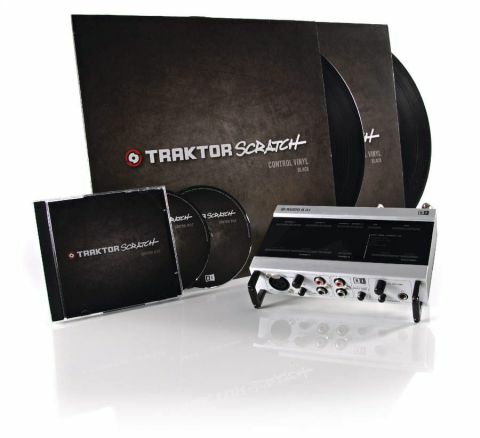 If you want to breathe new life into your DJing setup and spin MP3s as if they were vinyl, Traktor Scratch will work for you. Sounds and feels great. Quality hardware. MIDI compatible. Vast feature set. Display could be clearer. Fonts too small. Only two decks. Everything a digital DJ could ask for. Drag tracks from here to the virtual decks. Click and drag the wave display to cue files. Where Native Instruments are concerned, we´ve come to expect a certain high standard. Now the team have stepped it up with a new version of their award-winning Traktor software. This time, however, the software is accompanied by the Audio 8 DJ - an audio interface designed with the serious DJ in mind. It also comes bundled with two pairs of timecode discs - one pair for vinyl and another for CD turntables. It even comes complete with a set of multicore connection cables, making integration as simple as possible. In fact, the system is designed to be dropped into an existing DJing setup, so you will need your own hardware DJ mixer to use Traktor Scratch, since the virtual decks are piped straight to the soundcard outs, with no software mixing. On closer inspection it soon becomes apparent that this particular package has a lot more to offer than you might expect from a two-deck mixing setup, however. Thankfully, NI have endeavoured to cover every base, with a feature set that´s guaranteed to raise a few eyebrows. Let´s face it, latency has long been the arch enemy of DJs. Any DJ will appreciate how difficult it can be to do your job when there´s an obvious lag between what you do and what you hear. In the realm of digital audio it´s almost taken for granted that there will be some signal delay, so how does Traktor Scratch perform in this most important area? First of all, the Audio 8 DJ USB 2.0 audio interface comes with a set of low-latency ASIO drivers as standard. Within the software preferences are convenient templates with configurations to suit a range of different computer setups. We found that some of the lower latency settings worked very well, even on our modest test machine. More important than the numbers, though, is that it feels exceptionally tight, even at pretty high latency settings. You´ll find pulling off a tight mix or scratching with your digital audio files is no hardship for Traktor Scratch at all. The supplied vinyl timecode discs are pressed on high quality, lightweight 12¨ slabs, with a deeper groove on one side for a very comfortable scratching experience, and you can set the discs to respond in either 33rpm or 45rpm modes. Notable is the Beatjumper feature, which enables you to skip a number of beats backwards or forwards according to the detected BPM or Beatgrid - perfect for those situations when a fine dancer catches your eye, causing you to miss your cue. Have you ever wished to mix two records that can´t be beatmatched within the pitch range on your decks? Traktor Scratch boasts an adjustable range of pitch scales - plus or minus 8%, 35%, 50% and 100% - that are separate from the actual speed of the timecode disc. That means the digital audio file plays at the speed of your timecode disc plus the additional range of the software itself. It also comes with an adjustable Pitch Lock option so that playback speed and tuning can be altered independently. Another trick not possible with records is that you can set a loop, and then spin that vinyl back as it loops indefinitely. Chuck in NI´s quality filters and effects and the system can even serve as a sound editing tool. You can also route your mixer´s sends into the software and apply the effects to your music vinyls and CDs too. With the in-built recorder and capacity to play back high-quality 24-bit and 32-bit audio formats, there´s no reason why you couldn´t use it in your productions. After all, the Audio 8 DJ boasts 24-bit/96kHz audio and high-grade Cirrus Logic A/D and D/A converters. It´s a serious interface, for sure, with eight inputs and outputs, MIDI ports, status LEDs and a headphones out. There´s also a ground lift and rumble filters for your decks, and it´s clearly built to last. If you only want the interface, you can get it for £300, and, conversely, if you buy a ‘Traktor Scratch Certified´ integrated mixer/interface, you can get the software, vinyls and CDs as an upgrade kit, making a full setup. would be much more useful if you could blow the whole thing up even bigger. Some of the buttons and fonts could also benefit from being larger or clearer, and even the largest of the available fonts just isn´t quite big enough for our tastes. Also, there will no doubt be some of you who are wondering why there are only two decks when software DJing has the potential to allow us to work with more. However, the fact that these are the biggest gripes that we have with Traktor Scratch should tell you that overall this is a very enticing package for the modern DJ.